With the recent release of the 2012 Year of the Dragon Gold and Silver Bullion Coins, it may interest some to know that the Perth Mint of Australia is still offering collector grade strikes featuring the previous Year of the Rabbit designs. 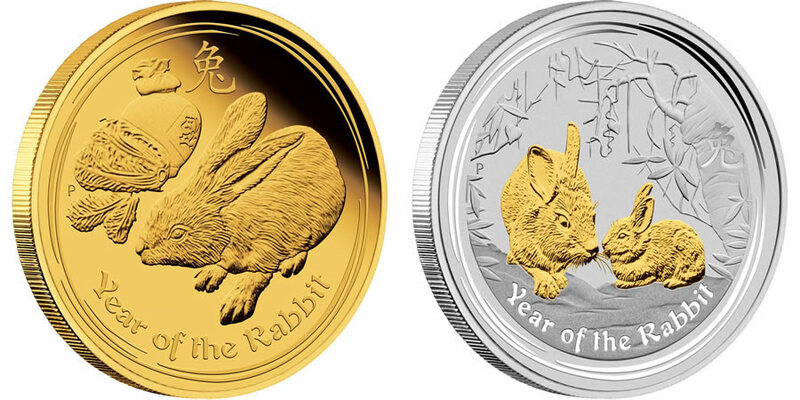 These remaining 2011 Year of the Rabbit Gold and Silver Coins may only be available for a limited time as either maximum mintages for specific strikes are met or production focus shifts to new designs. Until that time, collectors may order the 2011 Year of the Rabbit Gold and Silver Coins directly from the Perth Mint. Once no longer available from the Perth, collectors will have to turn to the secondary market to obtain the unique strikes. The coins continue the mint's tradition of striking coins featuring the creatures found on the Chinese zodiac. Bullion coins tied to the zodiac were first struck by the Perth in 1999 and collector grade coins featuring those same designs proved popular once they followed. The Year of the Rabbit runs from February 3, 2011 – January, 22 2012. Those born in the year are said to be feature the qualities of intelligence, ability to articulate, compassion and loyalty. The Perth Mint is currently offering three different sized gold proof coins featuring the 2011 Year of the Rabbit design. The coins come in 1 oz, 1/4 oz and 1/10 oz, each struck from 99.99% pure gold. The Gold Rabbit Coins each ship in an oval presentation case with a granite effect base and a glossy wood-like lid. A numbered certificate of authenticity also accompanies the strike along with the coin and the case in an illustrated shipper. Featuring a different rabbit design used by the mint for its silver coins, the 2011 Year of the Rabbit Gilded Silver Coin is struck from 99.9% pure silver with both the adult and the young rabbit selectively gilded in 24-karat gold. The Perth ships each of these coins in a red and black display case along with the numbered certificate of authenticity in an illustrated shipper. A maximum mintage of only 50,000 of the coins will be produced by the Perth.